In 2018, Latvia celebrates 100 years since we became an independent state on Nov. 18, 1918. The birth of Latvia as a state coincided with major changes on the political map of the world. We celebrate our centenary of statehood with the very best that we can offer: an ancient, well-rooted, but modern culture, great lifestyle and never-ending innovation. History is a big deal for Latvians. We feel that our history is special and it’s also certainly very complicated. It is a history of the birth and development of the idea of an independent nation, as well as a consequential struggle to attain, maintain and renew it. Coming to terms and dealing with the consequences of the past is an ongoing process, especially when the past is so turbulent, as is the case for Latvia. Latvia has been both an idea and a political reality, but not always concurrently. In the last 100 years, it is has been hit by brutal interventions, oppressions and destruction from bigger neighbours. But still, Latvians are resilient and we have shown that again and again. Latvia is a moderately sized, democratic member of the European and international system of national states. For Latvians, joining NATO and the European Union in 2004 were both significant events. Both organizations embody the values and visions that Latvians have held dear since the beginning of the fight for our own state. As a result, this has created a unique environment, the likes of which has not been found anywhere in the world. To find out what Latvia really is, you have to visit. Consider this my personal invitation to a cultural adventure that will take you to a country in Northern Europe, by the Baltic Sea, that is celebrating its centenary. Riga — the longstanding metropolis of the Baltics — was established as a city in 1201. 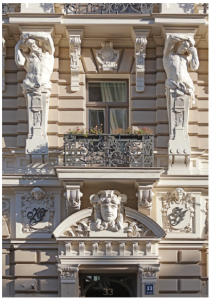 A picturesque and fairytale-like medieval town, Riga boasts rich, wooden 19th-Century architecture and above it all, the finest collection of Art Nouveau buildings in Europe. Understandably, the historical centre of Riga has been granted UNESCO World Heritage status. The unforgettable majestic skyline of Riga, with the Gothic spires of the numerous churches in the old town, is the most visible indication of the superb esthetic sense that has shaped much of the city’s architecture up to now. 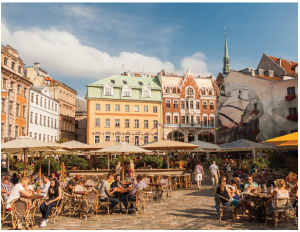 Riga is also host to numerous entertainment options for all ages and tastes, including museums, world-class opera, ballet, theatres, exhibitions, zoos, an open-air Skansen-style museum, cinemas, clubs and even casinos. 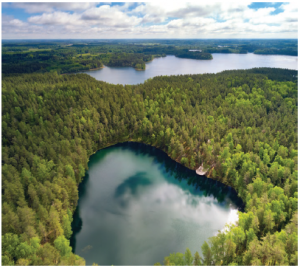 Any visitor will immediately discover our beautiful nature — bountiful forests, lush meadows, rich rivers, quiet lakes and above all, a 500-kilometre shoreline full of sandy beaches. 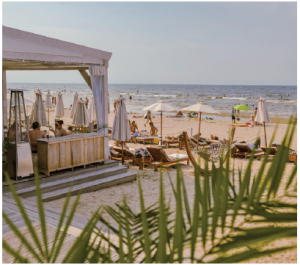 Jūrmala — whose name translates to “the city on the coast” in Latvian — is one of the finest resort towns in Northern Europe. Its sandy white beaches, pine-covered forests, mineral springs and naturally occurring medicinal mud has made it a favourite tourist and spa destination. Even during the windy spring and autumn seasons, the impressive sight of white-capped waves crashing into the shoreline recalls the untamed forces of nature at work. Once the storms have subsided, amber seekers scour the beachfront in hopes of finding pieces of this unique yellow-toned stone washed up along the coastline. Ask Latvians about typical Latvian cuisine and they will mention rye bread, bacon rolls (pīrāgi), pearl barley, grey peas with bacon, herring and smoked sprats, a fish that is similar to sardines. What we eat, and what remains typically Latvian, is food that is prepared from fresh, locally grown produce. For Latvians, a salad is always on the menu, soups are appreciated and so are dairy-rich products. What probably stands out the most is our smoked meat and fish, the revered Riga sprats (also available in Canada), fresh cottage cheese, traditional cheese with caraway seeds, sour cream and kefīrs, wild berries that are made into delicious desserts, jams and pastries, as well as mushrooms straight from the forest. 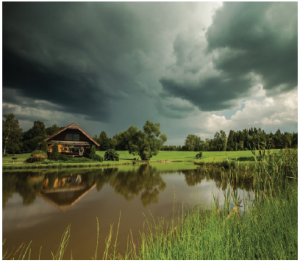 A typical Latvian is likely to celebrate a healthy mix of Christian, pre-Christian and commercial traditions. Similarly to the rest of Northern Europe, every Latvian celebrates the summer solstice or midsummer (called Līgo and Jāņi, on the 23rd and 24th of June) with folk songs and customs such as jumping over a bonfire and singing until dawn. Great festivities can be found for a few days all around the country. If you’re lucky enough to take part in them, you’ll remember them forever. It’s also very Latvian, and even important, to celebrate name days. Each person’s name has a specific day on the Latvian calendar, and it is marked with festivities that are similar to birthday celebrations. Unquestionably, the biggest event of all is the nationwide song and dance festival, held every five years. Imagine 16,000 mostly amateur singers on one stage singing a capella with all the nuances, technical skills, tonal colour and style you would expect from a professional ensemble. Imagine a corps de ballet of another 16,000, this time with dancers who create patterns on stage based upon ancient Latvian designs. Imagine a 50,000-person audience and the rest of the country watching the festival at home on TV. All of that, remember, happens in a country of only two million people. The Latvian Song and Dance Festival is an incredible phenomenon, recognized as a “masterpiece of the Oral and Intangible Heritage of Humanity” by UNESCO. This tradition, which dates back to 1873, is a grassroots festival that literally pervades all of Latvian society, engaging huge numbers of people from all walks of life and all around the world. What language do Latvians speak? We always like to get this question because we can inform anyone who is interested that we speak a very ancient language: similar to Sanskrit (the language of ancient India) and not Germanic or Slavic. The Latvian language belongs to the Baltic language group of the Indo-European family of languages. Its closest and only living relative in modern times is Lithuanian. In history books, you can also find the Old Prussian language, which is another close relative to Latvian and Lithuanian. Our languages appeared in the 6th and 7th Centuries AD. Based on the Latin alphabet, we have a few special features in our language, including guides to pronunciation by use of diacritics, which look like this: ā, č, ē, ģ, ī, ķ, ļ, ņ, š, ū, and ž. We also keep the old tradition of transcribing names and surnames as they are pronounced, and adding Latvian endings to properly conjugate names in sentences. You have to challenge your mind in order to see that Charles Dickens in Latvian is Čārlzs Dikenss. In order to understand us you have to know that every Latvian has his or her own folk song, known as dainas. Dainas are quatrains in the form of songs or poetry, carrying ancient wisdom and traditions. Dating back well over 1,000 years, these tales were part of celebrations, daily work and reflections on life. Dainas capture the Latvian worldview and are the core of Latvian cultural history. More than 1.2 million texts and approximately 30,000 melodies have been identified and collected in the Cabinet of Dainas, first published in 1894. I have a lot more to tell you, but visit Latvia, and you can see this all for yourself. Before you go, check out www.latvia.travel and for easier personal planning, you can use the trip planner at that site. Kārlis Eihenbaums is the ambassador of Latvia. Kārlis Eihenbaums is Latvia’s ambassador. Contact him by phone (613) 238-6014 or by email: embassy.canada@mfa.gov.lv.